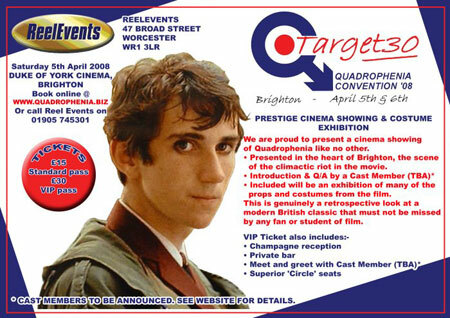 If you happen to love Quadrophenia, you might want to attend the Quadrophenia Convention in Brighton. It’s a two-day event in Brighton, running from April 5th to April 6th 2008, with appearances from the likes of Phil Daniels (Jimmy) Mark Wingett (Dave) Phil Davis(Chalky) Toyah Willcox (Monkey) Gary Shail (Spider) Garry Cooper (Peter) and Trevor Laird (Ferdy). No sign of Sting I see. There’s a range of events, talks and of course, a movie showing. You can even have a meal with the cast or a brew – but at a price. See the website for full details. Tickets are from £15. Do real Mods go there ?